Mr McElwaine has been shooting footage and stills of Sprinkleman which is gradually being added to a nice MySpace site. 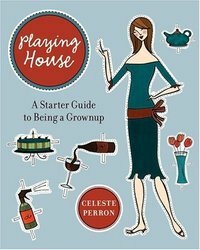 Something for the ladies: Part time PSFK contributor and full time journo Celeste Perron has just released her first book, "Playing House: A Starter Guide To Being A Grown Up". It's a self help book with a cool difference for young women in their twenties. Advice includes 'how to pick wine with confidence and mix cocktails that hit the spot' and 'making food that tastes delicious'. My suggestion is that if you're a chap and you see a young lady reading this book: marry her! !